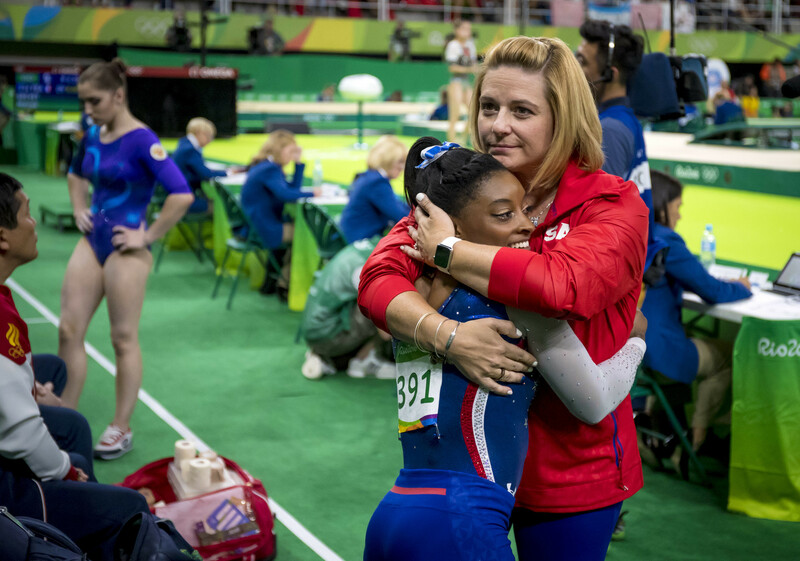 As well as this, Aimee was the Head Coach for Team USA at Rio alongside Team Coordinator Marta Karolyi. As Marta’s last Olympic Games as Coach, the Team were nicknamed ‘The Final Five’ who, thanks to the guidance of Aimee and Marta, collectively brought home 9 Olympic Medals. With the Rio Olympic Games coming to an end a couple of months ago - what are your thoughts and feelings looking back on the outstanding performances by your Team USA? I am so proud to have been part of the process of producing such an outstanding Team USA for women’s gymnastics. The girls were so prepared for their competition that even a misstep would not have effected the outcome. Is there one particular moment, event or performance that sticks out for you and why? Probably seeing the pure joy and emotion in Simone’s eyes when she was the official winner of the Olympic Gold Medal in the All-Around competition. It was in that moment that Simone realized that all of her sacrifices had been worth it. As Head Coach of the USA Team, can you explain your role during the Games and what differences are / were there between your role as Head Coach and Mártha Károlyi ’s role as Team Coordinator? As the head coach, I was expected to keep the girls on track during competition, including making sure that the equipment was set correctly, and to keep their “heads in the game”. Apart from the competition floor, I tried to be a mentor and an friend for the girls to express their needs, concerns and feelings to help them perform better. It’s fair to say that you are most known as the coach of the incredible gymnast Simone Biles who took 4 golds and a bronze in Rio. When you look back on the journey you and Simone have been on - taking her from a 7 year old brand new to gymnastics, to a 19 year old 4 time Olympic Gold medalist, how does it make you feel about what you as a Coach has achieved? I have never been a coach that coaches from my ego, so my answer might surprise some people. My goal as a coach has always been to raise healthy, happy kids. They are kids first, then athletes. I am so proud of showing that ultimate achievement with Simone. There is no one that can say that she is not a healthy, happy, well adjusted young lady, on top of being a World and Olympic Champion. 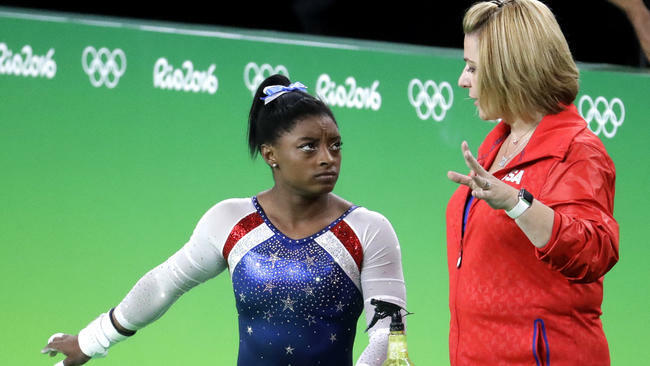 Her success has been a combination of how she was coached in gymnastics as well as how she was treated as a human. I have been involved with gymnastics for 37 years and I am honored that I could prove that you CAN do it “differently”. Simone is such a hugely talented athlete, do you think she would be as successful an athlete in any other sport (if so, which sport) or is she particularly suited to gymnastics? I have always said how incredibly ATHLETIC Simone is. She would have excelled at anything that she decided to do in sports. I am just grateful that she chose gymnastics to show her talents. Of course, being 4’8” and full of muscle doesn’t hurt your chances in gymnastics, but if you ask her what other sport she would do, she would tell you “track”…so she doesn’t see herself at 4’8”! What would you say has been the secret to yours and Simone’s success as a coach-athlete team? I have treated Simone the same as all of my other athletes. It’s about respect. I respect my athletes for their dedication and their sacrifices and it return their respect for me is returned ten-fold. Since Simone and I have been a duo for 11 years, we obviously have grown a deeper bond of trust and camaraderie. 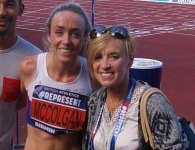 What has been the biggest lesson you have learned in the last few years of coaching someone to Olympic Glory and what pieces of advice would you give to other female coaches wanting to emulate your success? There are two things that I have preached to myself & others over the past few years…. #1 “It’s just gymnastics”. We are not curing cancer and saving lives here. This is a sport and it teaches great life lessons, but we need to look past the sport and see what kind of humans we are raising. #2 “You are exactly where you are supposed to be. Just Breathe.” This was my mantra at my first World Championships. Being among that level of competition with the best gymnast in the US could have been overwhelming, but I reminded myself of all of the training that I had done to get to that moment. I had to tell myself the same thing that we had been telling the girls. “Just like practice” and “normal”. It helped keep me calm and confident. You have recently accepted a new role in Florida and will be leaving the gymnastic club behind in which you and Simone developed your history making partnership - how hard is it from your point of view to walk away from athletes that you have coached for so long and see grow up and develop not only as athletes, but also as people. As a coach, you know that your athletes will always move on from you. It could be because they choose to do something besides gymnastics, or they stay with you their whole career and then you send them off to college. Either way, life moves one. I am thrilled with my move to Florida. It has been an amazing opportunity. Everyone needs to make changes in their lives. Change is about growth and it was important to me that I continued to grow. I miss seeing Simone everyday, but we are still in contact and she knows that I will always be here for her, in all aspect of her life. If she chooses to continue in gymnastics I will always be willing to coach her. But, for right now, I am thrilled to see the positive impact that she is having not only in the sport, but also in the world as we know it. Will you be aiming to be Head Coach again for Tokyo 2020? I would love to be the Head Coach again for Tokyo 2020. Rio was such an amazing experience for me that I would be thrilled to do it again…but, right now, the time has come for me to focus on my family. They have sacrificed just as much as I have for me to achieve my goals. We need more like Aimee in the sport, she is a gem. These are kids / young women and with the right nurturing and support, anything can be achieved. Thank you for taking the time to interview me. Women empowering women in sports! this is a good interview, keep the good work with the web page. A remarkable coach and awesome human being. The operative words is this article are team and respect. Simone and Aimee have proven that their relationship transcends sports. I have watched the growth of these two dynamic women over the past 4 years and “their” success can be attributed to cooperation and respect. I am sure there were difficult times, but they both knew there was goals for the greater good of both. I hope they can reunite, but most importantly I wish them continued success and happiness in their life journeys.